This is your official check in thread for the Walk STRONG 2.0 Plan! We’re so excited to continue the Walk STRONG journey with you and cheer you on along the way. Share your daily or weekly workout check ins with us here -support your fellow community members from around the world as we all keep walking STRONG together! Just in case you haven’t received it yet, you can download your printer friendly 6 Week Walk STRONG 2.0 [aka Phase III] calendar here: http://walkonwalkstrong.com/phase3 (fyi, if you print, you may want to print only page 1 to save ink as page 2 lists all the DVD program locations for the workout and is very image heavy). And please don’t forget to submit any questions here on this thread: http://walkonwalkstrong.com/check-in/question/questions-ask-them-here-please/ so we don’t miss them ? I just completed Steady, Ready, Go and it was awesome. Can’t wait to try another new workout. Hi there, i’m having problems logging in as it says the info is incorrect and then the link that’s sent to me to resolve the issue doesn’t work either. So I’m not sure if this post will show up but here goes!…. 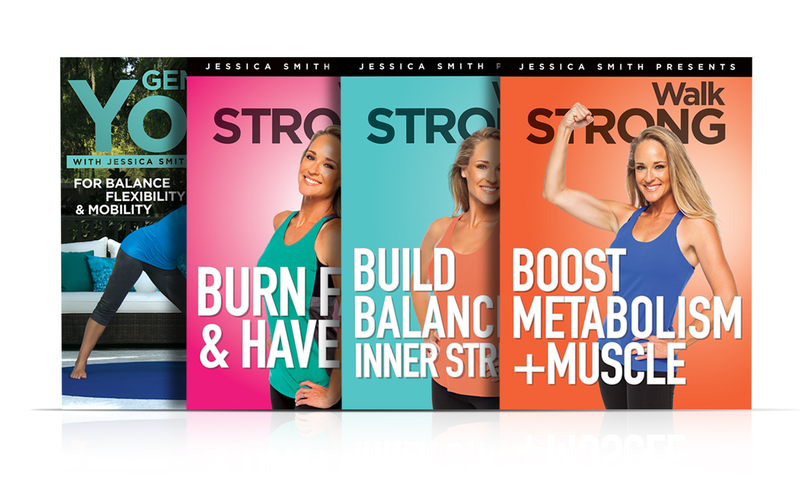 I have loved Jessica Smith workouts for yonks…I have most of the 10 minute solution dvd’s which is where I originally found Jessica… I loved her energy, her choice of music (love the 90s electronic dance), her clear instructions and the fact that she always exercised to the rhythm of the music! so many instructors don’t do this which really frustrates me. She was so down to earth and accessible and also had great form and technique so I felt great following her workouts. Since having my 3rd child 11 years ago, I have struggled with weight gain. My l4/l5 disc prolapsed 2 months after giving birth and for 5 years I was left to ‘manage the pain’. I then had a few other extra health issues such as gallbladder probs and under active thyroid and from then on I haven’t been really been the same. Running used to be my go to for losing weight but I’m not very good at that these days and now I weight an uncomfortable 86kgs. I should be around 65kgs. So, this is it, I’ve finally decided to give this challenge a try and am very excited. I just hope I can stick with it as I’ve been known to give up quite quickly on things as being a mum can be exhausting. Not only can time be an issue but food becomes my friend when I’m stressed. So here goes…… I’ve just completed Day 1 Cardio Party and I loved it….. thanks so much Jessica!!! Hi there espisp! We can see your post, yay! Welcome to the program and to our community! We’re so glad you are here and that you decided to make this commitment to your health and can’t wait to join you on this journey. What a great example you are setting for your family, love it! We look forward to joining you for day 2 soon 🙂 We are here for you every step of the way!! I finished Day 39 of the 6 Week Transformation!! So close to being finished!! This is the longest I have ever stayed with a program!! Woo hoo! Almost to the 6 Week finish line Kirsten – congrats to you on all of your hard work. Keep it up, you are doing great 🙂 We would love to continue on this journey with you! Days 3 & 4 complete! Brain Fitness Fun really makes the brain THINK!!! Really enjoyed the Barefoot Fusion Sculpt today just because I didn’t have to put on my shoes!!! Just kidding – I enjoyed it because I’m getting stronger and stronger and losing those lbs! The system won’t let me create a new user name or recover my password so I’m not sure my post is going to show up but here goes nothing! I have been skipping around Jessica’s YouTube channel and trying to make up my own system for over a month. Finally gave up and decided it was worth the money to focus on ME! Today is day 2 and I’m loving knowing exactly what video is next and not having to try to be the exercise guru. Now I just get up and do it! Thanks Jessica! Well I can’t find my original post (I’m not super tech savvy) but I was saying that I just found out I am pregnant. Jessica thank you for your comment. I did some research yesterday and I am happy to say I found nothing in the pregnancy world that is even close to what I have with your program so I would really like to stick with your workouts. I have only done the walk on, walk strong. Would you recommend any other of your programs that would be good for pregnancy. Did “Have a Ball” yesterday which is deceivingly difficult! I love the variety and the challenge but also that you don’t focus on a bikini body but rather having a healthy body that is strong and able to carry me through my busy day.